Canary Wharf Group plc has completed construction of Canary Wharf Crossrail station’s platform level five months ahead of schedule, making it ready to receive the two eastern TBMs in 2013. Construction of the Crossrail project began at North Dock in Canary Wharf less than three years ago. Since then the construction team has driven over 1,000 piles and pumped nearly 100 million litres of dock water. Approximately 300,000 tonnes of material has been excavated from beneath the dock bed and almost 375,000 tonnes of concrete poured. 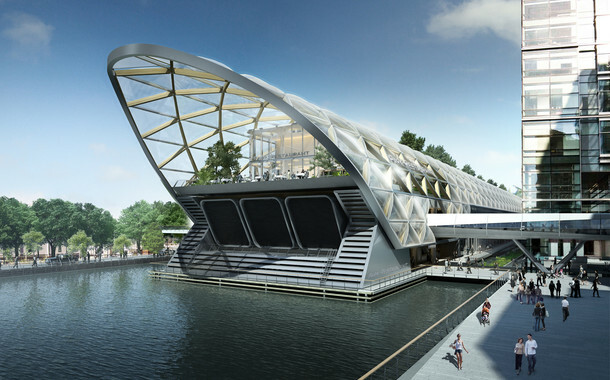 Canary Wharf Crossrail station will be one of the largest stations on the Crossrail route. In December 2008 Canary Wharf Group plc signed an agreement with TfL, DfT and Crossrail to design and construct the station box for a fixed price of US$798M, of which US$239M is contributed by Canary Wharf Group. In addition to Canary Wharf Contractors Limited, Arup Engineering acted as the geotechnical, structural and building services consultant; Tony Meadows Associates prepared the station design concept and acted as operations architect; Foster and Partners acted as the project design architect; Gillespies acted as landscape architect for the oversite development’s roof-top park; and Adamson Associates acted as the project executive architect for the oversite development’s retail mall.